The Villas at Jumping Brook is a 55+ community located in Neptune City, NJ. This active adult neighborhood has an extensive list of amenities that keep residents socially active and physically fit. Homeowners take full advantage of the long list of amenities by organizing clubs and events. With just 168 single-family homes, The Villas at Jumping Brook has a friendly atmosphere where neighbors become fast friends. 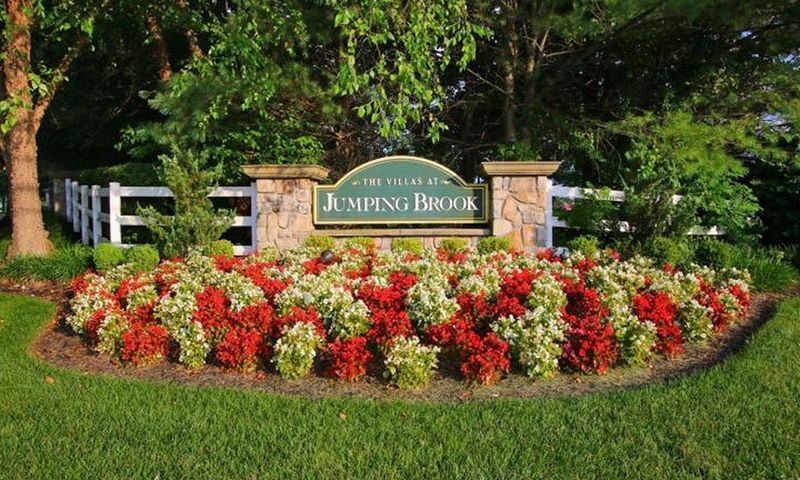 The Villas at Jumping Brook has great amenities, homes, and a desirable location in Monmouth County, NJ. At the center of the community is a lovely clubhouse. Residents can organize clubs in the multi-purpose room or prepare a meal in the catering kitchen. Explore a new hobby in the arts and crafts room or join a game in the cards or billiards room. A library is perfect for finding a new favorite book. Homeowners can also say goodbye to expensive gym fees thanks to the on-site exercise room that has cardiovascular and weight-training equipment. The terrific amenities continue outdoors with a beautiful pool and patio. Challenge a friend to a game on the tennis or bocce ball courts. Green thumbs will love the gardening plots and walking and biking trails that weave throughout the community. Community transit also provides transportation to local destinations. The Villas at Jumping Brook was developed between 2001 and 2003 and contains 168 single-family homes. These homes range in size from approximately 1,695 to 2,727 square feet and have two or three bedrooms, two bathrooms, and an attached two-car garage. Most homes in this 55+ community are elegant yet simple, containing dramatically tall ceilings, dens, hardwood floors, eat-in kitchens, and covered back patios that overlook tree-lined yards. The homeowners' association fee includes snow removal and trash removal, as well as common area and lawn maintenance. Residents of The Villas at Jumping Brook place a premium on social interaction and sharing common hobbies. Enjoy an evening with friends and neighbors with holiday parties, social clubs, or the women's club. Homeowners love friendly competition by organizing games of cards, tennis, bocce ball, or billiards. Groups are also formed around shared interests like gardening or books. No matter how you like to spend your time, The Villas at Jumping Brook will have something for you. The Villas at Jumping Brook is located in Neptune City, New Jersey. Around the corner from the community's entrance are several stores for everyday needs like restaurants, The Home Depot, Walgreens, banks, a Walmart, and the Jersey Shore Premium Outlets mall that has over 120 stores. Garden State Parkway is nearby for traveling around the state and Newark Liberty International Airport is just 40 miles from The Villas at Jumping Brook. Playing a round of golf is easy with the Jumping Brook Country Club in the community's backyard. Shark River Park is also nearby and when the mood strikes for some big-city entertainment, New York City is about 50 miles away and is accessible via public transportation. The Villas at Jumping Brook has everything an active adult could want or need in Monmouth County, New Jersey. There are plenty of activities available in The Villas at Jumping Brook. Here is a sample of some of the clubs, activities and classes offered here. The Villas at Jumping Brook was developed between 2001 and 2003 and contains 168 single-family homes. These homes range in size from approximately 1,695 to 2,727 square feet and have two or three bedrooms, two bathrooms, and an attached two-car garage. Most homes in this 55+ community are elegant yet simple, containing dramatically tall ceilings, dens, hardwood floors, eat-in kitchens, and covered back patios that overlook tree-lined yards. Please Note: Floor plans are not available at this time. 55places.com is not affiliated with the developer(s) or homeowners association of The Villas at Jumping Brook. The information you submit is distributed to a 55places.com Partner Agent, who is a licensed real estate agent. The information regarding The Villas at Jumping Brook has not been verified or approved by the developer or homeowners association. Please verify all information prior to purchasing. 55places.com is not responsible for any errors regarding the information displayed on this website.